Wile E. Coyote (also known simply as "The Coyote") and The Road Runner are a duo of cartoon characters from a series of Looney Tunes and Merrie Melodies cartoons. 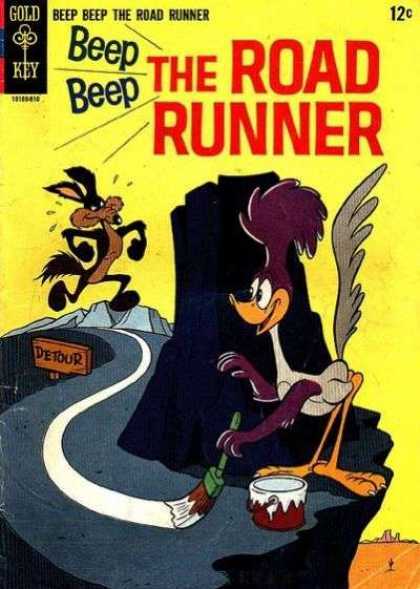 The characters (a coyote and Greater Roadrunner) were created by animation director Chuck Jones in 1948 for Warner Bros., while the template for their adventures was the work of writer Michael Maltese. In each cartoon, instead of animal senses and cunning, Wile E. Coyote uses absurdly complex contraptions (sometimes in the manner of Rube Goldberg) and elaborate plans to pursue his quarry. It was originally meant to parody chase cartoons like Tom and Jerry, but became popular in its own right. The Road Runner vocalizes only with a signature sound, "Beep, Beep", recorded by Paul Julian, and an occasional "popping-cork" tongue noise.